WARNING: Foreigners traveling to India are advised not to carry or use the Thuraya/Irridiun Satellite Phones. Any foreigner found holding or carrying Thuraya/Irridium Satellite Phones would be prosecuted with confiscation of such satellite phones and other penalties under relevant provisions of the Indian Wireless Act and the Indian Telegraph Act. With effect from July 25, 2011, Indian Embassy in Muscat has outsourced its Passport and Visa services through open bidding process to M/s. BLS International Services LLC-Oman. All the Passport and Visa applications are accepted and delivered only at the Indian Passport & Visa Service Centre of M/s. BLS International Services LLC-Oman located at: 4th Floor (C Block), Al Tamimah Building (Polyglot Institute) Way No 327, Building No 1340 Wattayah, Muscat Phone: 24568970, 24568971 Fax: 24568972. All Visa applications are to be filled online & the print out of the filled in form must be submitted along with the necessary documents, at the BLS Centre. All foreign nationals entering India are required to possess a valid international travel document with a minimum remaining validity of six months in the form of a national passport or any other internationally recognized travel document like UN Laissez Faire for establishing his/her nationality with a valid visa obtained from an Indian Mission or Post abroad. Nationals of Nepal, Bhutan and Maldives are however, exempted from this requirement. * Passport should be valid for a minimum period of six months beyond the date of intended departure from India and should have at least two blank pages. Fee once paid is not refundable. * Passport in original and photocopy of the first five pages, visa page (non Omani nationals) and address page to be submitted. * Copy of Residence Proof / ID card issued by Oman Government to be enclosed. * Paste one photo and staple another on the application form at a specified place. * The application form should be filled in English only and ensure that all columns are filled neatly and correctly. Incomplete applications and those which lack details will be summarily rejected. * A supporting letter from the company/organization in which the applicant is working in case of all nationals other than those of Oman. * Special Visa application forms should be filled in by citizens of Pakistan. * Each visa application is considered on its merits and may ask for additional information at any stage during the processing of the application. Submission of application along with prescribed fee does not guarantee issuance of visa. * Applicants who are not citizens/residents of Oman and hold a tourist visa for Oman should normally apply for Indian visas in the countries of their permanent residence. The processing time in such cases is usually 5 working days. * Visa is given for a period for which passport is valid. For example, if a passport is valid until April 30, 2010 and an applicant is applying for 5 years visa on Oct. 31, 2007, the applicant will not be issued a 5 years visa as the passport expires before the 5 years visa. * Validity of all visas is counted from the date of the issue of visa and not from the date of entry into India. * Registration with the concerned FRRO/FRO is compulsory within 14 days of first arrival in India if such an endorsement appears on the visa. * The Visa fee rates are not applicable to the nationals of SAARC countries or where there is a bilateral agreement. Journalist visa fee will be charged according to the period of Visa. Tourist Visa Please apply for visa online and take a print out of the filled in form and submit the same at the BLS Centre or its nearest mobile collection centre along with one recent passport size photograph, passport in original, a photocopy of its first five pages, and confirmed return air ticket in original along with its photocopy. Tourist visa will be granted to a foreigner who does not have a residence or occupation in India and whose sole objective of visiting India is recreation, sightseeing or casual visit. No other activity is permissible on a Tourist Visa. Normally, tourist visa is issued for a period of 6 months with multiple entry. There should be a minimum gap of 2-months between two successive visits to India on Tourist Visa for the nationals of Afghanistan, China, Iran, Iraq, Maldives, Pakistan, Sudan, foreigners of Pakistan origin and Stateless persons. The restriction of 2-months gap for re-entering India does not apply if foreign nationals visit India on any other type of visa. Applicant should submit the Visa form duly filled along with original passport and two photographs as per general guidelines. * Citizens of Finland, Japan, Luxembourg, New Zealand, Singapore, Cambodia, Vietnam, Philippines, Laos, Myanmar, Indonesia and Republic of Korea shall be granted “Tourist Visa - on - Arrival”. * The sole purpose of visiting India on tourist visa on arrival should be for recreation, sightseeing, casual visit, visit to meet friends or relatives etc. and no other purpose/activities. * The applicant does not have a residence or occupation in India. * The applicants' passport has minimum 6 months validity and a re-entry permit if that is required under the law of the country of nationality of the applicant. * The applicant should be of assured financial standing (the production of return ticket and availability of sufficient money to spend during his stay in India). * The applicant is not a persona-non-grata to the Government of India. * The citizens from the above named countries who would like to visit India for longer duration should approach Indian mission and would be granted visa by the Indian missions concerned. * The facility shall not be available to citizens of above countries (Finland, Japan, Luxembourg, New Zealand and Singapore) if either of his/her parents or grandparents (paternal or maternal) was born in and was permanently resident in Pakistan. Such persons can visit India after obtaining appropriate visas from the Indian missions concerned. * Tourist visa on Arrival of foreign nationals who fall ill after their entry into India and require specialized medical treatment may be converted to ‘Medical visa’. In such cases, tourist visa on arrival of the attendant may also be converted into medical attendant (Med‘X’) after submission of medical certificate from government/government recognized hospitals. * A fee of US$ 60/- or equivalent amount in Indian rupees per passenger (including children), will be charged from each applicant for grant of Tourist visa on Arrival. * This facility will not be applicable to holders of Diplomatic/official passports. Medical visa is admissible to all foreign nationals seeking Medicare in recognized specialty hospitals or treatment centers in India. Although non exhaustive, following illustrative list of serious ailments would be of primary consideration; neuro-surgery; ophthalmic disorders; heart related problems; renal disorders; organ transplantations; plastic surgery; joint replacement etc. 1) General guidelines for visa application are applicable in this case also. However, additionally medical visa application form should be accompanied with a referral letter or preliminary medical advice from the Oman hospital, recommending specialized medical treatment abroad and a letter from the medical hospital in India, indicating appointment or showing willingness to undertake treatment. 1) The visa is granted for a maximum period of six months or for the period of treatment whichever is less for seeking medical attendance only in reputed/recognized specialized hospitals/treatment centers in India. 2) It is mandatory for the foreigners coming on Medical visa to get themselves registered well within the period of 14 days from the date of arrival with the concerned FRROs/FROs, in case the applicant is required to stay in India for more than 6 months for the treatment. 3) Such visa will be valid for maximum three entries during one year. 2) Attendant/family members of the patient coming to India for medical treatment shall be granted medical attendant visa co-terminus with the 'Medical Visa' of the patient. Such visa may be granted to the spouse/ children or to those who have blood relations with the patient. Such a visa can be issued to a maximum of two persons in the family. 3) Medical attendant visa holders are also required to get themselves registered within the period of 14 days of arrival in India with the concerned FRROs/ FROs, in case the applicant is required to stay in India for more than 6 months for the treatment. 4) Such visa will be valid for maximum three entries during one year. 1) A letter from the Oman Chamber of Commerce and Industry, or from the sponsor company certifying that the applicant is employed in their organization and is proceeding to India on a business trip. 2) Proof of financial standing and expertise in the field of intended business. 3) An invitation letter from the company/ organization based in India inviting the applicant for this business trip. 4) The passport should have Oman residence visa valid for two years. 1) The applicant is a person of assured financial standing and expertise in the field of the intended business. 2) The applicant is not visiting India for the business of money-lending or petty-trading, or for full time employment in India involving payment of salary in India etc. 3) Business Visa is extended to senior executives of firms, experts, tour conductors and travel agents, etc., visiting India in connection with work related to projects of national importance, including those undertaken by public sector undertakings, and conducting business tours of foreigners or business relating to it, etc. 4) A foreign national will have to comply with all other requirements like payment of tax liabilities etc. 5) The grant of Business Visa is subject to any instructions issued by the Government of India on the basis of reciprocity with other foreign countries from time to time. 6) The Business Visa must be issued from the country of origin, or from the country of domicile of the foreigner provided the period of permanent residence of that applicant in that particular country is for more than 2 years. 7) Foreign nationals who want to visit India to establish industrial/business venture or to explore possibilities to set up industrial/business venture in India. 8) Foreign nationals coming to India to purchase/sell industrial products or commercial products or consumer durables. 9) Foreign nationals coming to India for technical meetings/discussions, attending Board meetings, general meetings for providing business services support. 10) Foreign nationals coming to India for recruitment of manpower. 11) Foreign nationals who are partners in the Business and/or functioning as Directors in the company. 12) Foreign nationals coming to India for consultations regarding exhibitions, for participation in exhibitions, trade fairs, business fairs, etc. 13) Foreign buyers who come to transact business with suppliers/ potential suppliers at locations in India, to evaluate or monitor quality, give specifications, place orders, negotiate further supplies etc., relating to goods or services procured from India. 14) Foreign experts/specialists on a visit of short duration in connection with an ongoing project with the objective of monitoring the progress of the work, conducting meetings with Indian customers and/or to provide some high level technical guidance. 15) Foreign nationals coming to India for pre-sales or post-sales activity not amounting to actual execution of any contract or project. 16) Foreign Trainees of multinational companies/corporate houses coming for in-house training in the regional hubs of the concerned company located in India. 17) Foreign students sponsored by AIESEC for internship on project based work in companies/industries. A Business Visa with multiple entry facilities is granted for a period ranging from one month upto 5 years depending on the assessment by the Indian mission Stay stipulation will be prescribed for each visit by the mission. 1 Q. Whether the Business visa can be converted to any other type of visa within the country? -Business visa in case of Persons of Indian Origin, who were otherwise entitled for ‘X’ (Entry) Visa but have entered into India on Business visa, can also be converted to ‘X’ Visa. -Business visa of the foreigners who fall ill after their entry into India rendering them unfit to travel and require specialized medical treatment may be converted to Medical visa if they are eligible for grant of Medical Visa and medical certificate is obtained from government / government recognized hospitals. In such a case, ‘X’ visa of family members/ attendant accompanying the foreigner (whose ‘Business’ visa is converted into Medical Visa) may also be converted into Medical Attendant [Med X] visa co-terminus with the Medical visa of the foreigner. 2 Q. Can foreign nationals coming to execute projects in India be granted Business Visas? 3 Q. Can foreign nationals already in India for executing projects on Business Visas be allowed to extend their Business Visas? 4 Q. Can foreign nationals already in India for executing projects on Business Visas be allowed to convert their Business Visas to Employment Visas without leaving the country? 5 Q. Which category of Visa will be granted to family members of foreign nationals coming to India on Business Visa? General guidelines for visa application are applicable in this case also. The maximum validity of Employment Visa is one year. The Employment Visa can only be issued from the country of origin, or from the country of domicile (more than two years stay). Non-Oman passport holders applying for an Employment Visa must submit a copy of their Oman residence visa showing that they have been resident in Oman for more than two years. Family members / dependents of an applicant who is granted ‘E’ (employment) visa will be granted ‘X’ visa provided the family members are otherwise eligible for grant of such a visa. The validity of such ‘X’ visa shall be co-terminus with the validity of the visa of the principal visa holder or for such shorter period as may be considered necessary by the Indian Mission. 1) A highly skilled / skilled and qualified professional or a person who is engaged or appointed by a company, organization, industry, or undertaking in India on contract or employment basis at a senior level in skilled position such as technical expert, senior executive, or in a managerial position, etc. 2) Foreign nationals coming to India as consultant on contract for whom the Indian company pays a fixed remuneration, (may not be in the form of monthly salary). 3) Foreign artists engaged to conduct regular performances for the duration of the employment contract given by Hotels, Clubs, and other organizations. 4) Foreign nationals who visit India to take up employment as coaches. 5) Foreign sportsmen who are given contract for a specified period by the Indian Clubs / organizations. 6) Self-employed foreign nationals coming to India for providing engineering, medical, accounting, legal or such other highly skilled services in their capacity as independent consultants. 7) Foreign language teachers / interpreters. 9) For issuing of Employment visa to skilled/ highly skilled foreign workers in the IT software and IT enabled services sector (ITes), following two conditions must also be satisfied. 10) The sponsor must declare that they are an IT / ITes company. 11) sponsor must confirm that they are an Export Orient Unit (EOU) or an IT unit delivering services from an Special Economic Zone (SEZ). 1 Q. What is an Employment Visa? (i) The applicant is a highly skilled and/or qualified professional, who is being engaged or appointed by a company/ organization/ industry/ undertaking in India on contract or employment basis. (iii) The foreign national seeks to visit India for employment in a company/ firm/organization registered in India or for employment in a foreign company/ firm/organization engaged for execution of some project in India. 2 Q. What are the other categories of foreign nationals who are eligible for Employment visa? 3 Q. What is the duration of an Employment visa? (i) A foreign technician/expert coming to India in pursuance of a bilateral agreement between the Government of India and the foreign government, or in pursuance of a collaboration agreement that has been approved by the Government of India, can be granted an Employment visa for the duration of the agreement, or for a period of five years, whichever is less, with multiple entry facilities. (vii) The Employment visa may be extended by the State Governments / Union Territories / FRROs / FROs beyond the initial visa validity period, up to a total period of 5 years from the date of issue of the initial Employment Visa, on an year to year basis, subject to good conduct, production of necessary documents in support of continued employment, filing of Income Tax returns and no adverse security inputs about the foreigner. The period of extension shall not exceed five years from the date of issue of the initial Employment visa. 4 Q. Which category of visa will be granted to family members of foreign nationals coming to India on Employment? c) Employment visa of the foreigners who fall ill after their entry into India rendering them unfit to travel and require specialized medical treatment can be converted to Medical visa if they are eligible for grant of Medical Visa and medical certificate is obtained from government/government-recognized hospitals. In such a case, ‘X visa’ of family members/ attendant accompanying the foreigner (whose ‘Employment’ visa is converted into Medical Visa) can also be converted into Medical Attendant [Med X] visa co-terminus with the Medical visa of the foreigner. Residential Permit - “Employment/Business not permitted”. 6 Q. Whether a foreign company/organization that does not have any Project office/ subsidiary / joint venture/branch office in India can sponsor a foreign national/employee of a foreign company for Employment visa? 7 Q. Whether an Indian company/organization which has awarded a contract for execution of a project to a foreign company that does not have any base in India, can sponsor employee of foreign company for Employment visa? 8 Q. If the Indian organization/entity sponsors an Employment visa, does this mean that the Indian organization/entity has to necessarily be the legal employer of the person? 9 Q. Which category of visa will be granted to the foreign language teachers/interpreters? 10 Q. Which category of visa will be granted to the foreign specialist Chefs? 11 Q. Which type of Visa would be granted to senior management personnel and/or specialists employed by foreign firms who are relocated to India to work on specific project / management assignment? (a) Foreign nationals visiting India on short visits to customer’s locations to repair plant or machinery as part of the warranty or annual maintenance contracts. (b) Foreign engineers/technicians visiting India for installation and commissioning of equipments/machines/tools in terms of the contract for supply of such equipment/machine/tools. (c) Foreign experts visiting India for imparting training to the personnel of an Indian company. (d) Foreign personnel deputed for providing technical support/services, transfer of know-how, services and supplies for which the Indian company pays fee/royalty to the foreign company. A letter of approval or No Objection Certificate (NOC) from Ministry of Health in case of admission to medical or para-medical course is also to be submitted with the application. The letter of approval or NOC can be obtained from the college/institute where admission has been confirmed. 1) Foreign Students are allowed to study in recognized graduate and post graduate level medical, Para-medical, engineering and Technical institutes in India. Foreign students intending to pursue regular academic courses in India should apply for Student Visa. 2) General guidelines for visa application are applicable in this case also. However, additionally the visa application form should be accompanied with- a firm proof of admission to a recognized University/educational institution and a letter from the Ministry of Higher Education, Sultanate of Oman, should accompany the application. 3) Further, a letter of approval or No Objection Certificate from Ministry of Health, Government of India (GOI) in case of admission to medical or Para-medical courses and from Ministry of Human Resources Development (Department of Education) (GOI) in case of Engineering and Technical courses is required. This letter of approval can be obtained from the college/institute where admission has been confirmed. 4) Satisfactory evidence of financial support with a bank guarantee for R.O.500/. 5) The student visa is issued for the period of study (Maximum period of validity is five years) in India. There might be some cases where the applicants do not have firm letters of admission from the college/institute because of the procedure which requires admission tests etc. Such students may apply for Provisional Student Visa on the basis of Provisional Admission Certificate issued by the university/institute. Visa in such cases will be limited to a period of six months. Further renewal of student visa can be done through the State Government/Foreigners Regional Registration Office (FRRO) who are empowered to grant a regular student visa for the duration of the course or a period of 5 years, whichever is less. Journalist visa is issued to professional journalists and photographers visiting India. The applicants are required to contact the External Publicity Division of the Ministry of External Affairs and in other places, the Office of the Government of India's Press Information Bureau on arrival in New Delhi. Foreign journalists visiting India on long term assignments (i.e. to be based in India), have to fill up the online form http://pibaccreditation.nic.in under category New users – select option – “I am applying through Indian Mission abroad) for issuance of PIB cards simultaneously with submission of their “J” visa application, in order to facilitate timely issuance of PIB cards. Conference visa is issued for attending conferences / seminars / workshops in India. A letter of invitation from the organizers of the conference is to be submitted along with the visa application. Issue of Conference visa is subject to approval of conducting the event by the concerned Ministry of Central/ State governments of India. Delegates visiting attend conferences may combine tourism with attending conferences. Who is eligible for a Conference visa? (i) Whose sole objective of visiting India is to attend a conference/ seminar or workshop being held in India. (v) Who is a person of assured financial standing (the production of a return ticket and availability of sufficient money to spend during his stay in India may be considered sufficient for this purpose). 1 Q. What is the procedure for grant of Conference Visa? Ans: Indian Missions are authorized to issue Conference visas to delegates on production of an invitation to a conference/seminar/workshop being organized in India by a Ministry or Department of the Government of India, State Governments or UT administrations, Public Sector Undertakings, Central Educational Institutions, Public Funded Universities or an organization owned and controlled by the Government of India or any State Government / UT, United Nations or its specialized agencies. Missions will process the cases for grant of visas and after satisfying themselves, grant visas to the participants of such events. 2 Q. What is the duration of the Conference visa? Ans: Conference visa will be issued for the duration of the conference and the travelling time. However, the delegates coming to attend conference etc. in India can combine tourism with attending the conference. Missions can, at their discretion, grant visas for the required period. Such visa shall not exceed maximum validity of Tourist Visa or 6 months subject to usual conditions applicable for grant of the Tourist visa. A transit visa is granted for the sole purpose of enabling the holder to travel through India to reach his/her ultimate destination. Change of purpose is not allowed. The visa will ordinarily be valid for a single/double journey and for entry within 15 days of date of issue. The transit visa is valid for direct transit only for a maximum period of 3 days. Confirmed air ticket for onward journey and valid visa for final destination are required. For a stay in India beyond 3 days, an appropriate visa should be obtained. Single entry visa valid for the duration approved by the Government of India is issued. Three copies of the letter from the sponsoring organization indicating intended destination in India, expected length of stay, and nature of work to be discharged should be attached along with a guarantee for applicant’s maintenance while in India. Approval of Ministry of Human Resources Development (Department of Education), New Delhi, should accompany the visa application. The validity of the visa would coincide with the research period. Pakistani nationals resident in Oman may submit 6 sets of prescribed application form duly filled in with 12 recent passport sized photographs, present and all previous passports, a photocopy of the first five pages and visa page and the address page of the current passport and documentary evidence as may be required. Visitor visa is granted to Pakistani nationals, to meet relatives or friends in India or for any other legitimate purpose, and documentary proof in support thereof should be furnished. 1) The document should provide a complete verifiable address of the relative in India with the relationship. 2) Application should be complete in all respects and should in particular, indicate port of arrival as well as details of previous visits to India, If any. 3) However, Applications for business visa should be supported by a letter from the Chamber of Commerce & Industry/sponsor and invitations from companies in India and the invitation should have been attested by the Chamber of Commerce concerned. The visa fee is Omani Rials 0.900 (Two hundred baiza) plus R.O. 1.200/- as service charge. Applications of Pakistan origin persons for visa of all categories will be dealt with according to concerned Ministry guidelines issued from time to time. Applicants holding dual nationality of Pakistan (including Pakistan origin card) and some other country should apply only on their Pakistan passport, if they are still holding valid Pakistani passport. Visa for foreign nationals of Pakistani origin will be issued only for a period of 3 months with single entry. Photocopy of visa in case of previous visit if any. Additional information sheet incorporating details of Pakistan origin should be filled up by all visa applicants. 1) Three photographs and passport copy. 2) Two references in Oman along with telephone numbers and one or more references in India along with contact number. The applicant may submit a certified copy of his/her updated bank statement along with the application form, original passport, a copy of the passport and two photographs. Diplomatic Visa & Official Visa for official purposes would be given gratis provided the application is submitted along with a Note Verbale from the concerned Embassy/Ministry of Foreign Affairs, Oman clearly mentioning the purpose of visit. The applicant should submit the application form at the Embassy between 9 am and 12.30 pm on Embassy working days. All such visas will be valid for an initial stay of three months/two months in India. 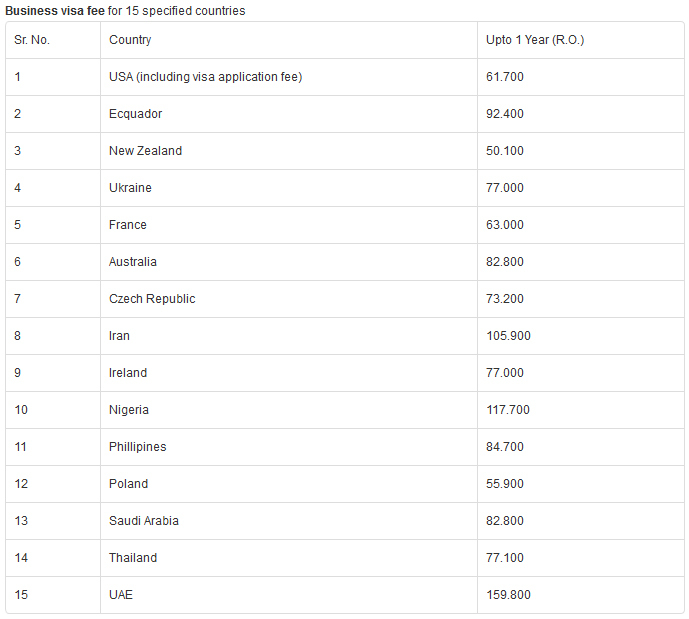 Further a list of exemptions of visa for Diplomatic and official passport holder of certain countries is as under. Those employed by international organizations require visa. The holder of an official passport is not entitled to an official gratis visa when the visit is not in connection with official business. Note : The above mentioned rates are not applicable to the nationals of SAARC countries or where there is a bilateral agreement. Journalist visa fee will be charged according to the period of Visa.